Author note: I have made several different types of Bolognese recipes. 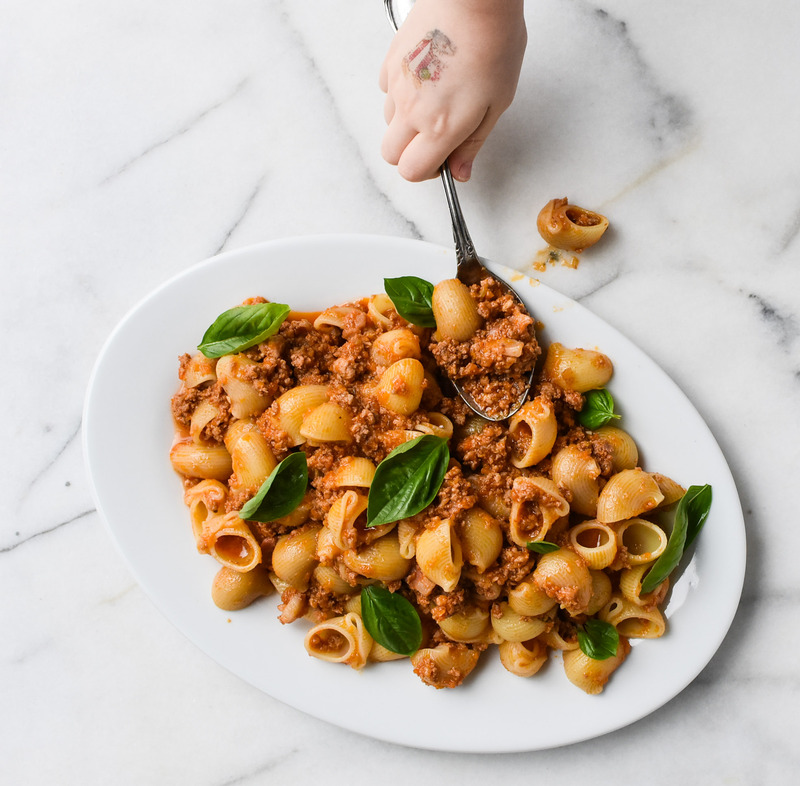 The two types of Bolognese can generally be divided between ones that use red wine OR ones that use white wine and milk. I prefer the flavor that white wine and milk bring create. This recipe is easily doubled and is freezer friendly. Read more about my Bolognese obsession and watch an instructional video on how-to-make Bolognese at The Dallas Morning News (click here for the full story and video). Turn the heat to high and add the vegetables to the sauce pan. Cook for about 10-15 minutes, or until the liquid has been absorbed and the vegetables start to brown and stick to the bottom of the pan. Stir frequently. Add the ground beef, ground pork and salt to the vegetable mixture. Stir well to incorporate. Cook for 10-15 minutes, or until the meat begins to stick and brown to the bottom of the pan. Reduce the heat to medium. Add the tomato paste. Stir well and frequently. Cook for 2-3 minutes. Add the milk and thyme. Stir well. Bring to a simmer and cook for 1 hour. Stir occasionally. Serve warm with cooked pasta. This entry was tagged bolognese, bolognese recipe, dallas food blog, dallas food blogger, easy bolognese recipe, freezer friendly bolognese, good bolognese recipe, ground beef, Ground Pork, how to make bolognese, Italian meat sauce recipe, Italian ragu, meat sauce, ragu, ragu recipe, spaghetti bolognese, spaghetti sauce, texas food blog, texas food blogger, white wine and tomato paste. Bookmark the permalink.